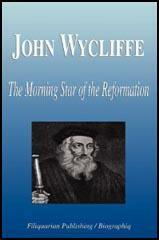 John Wycliffe was born in Ipreswell in Yorkshire in about 1325. Information about his early life is scarce. 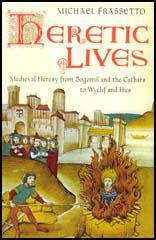 Wycliffe came from a wealthy country and in about 1350 went to Balliol College. We must question whether the laws enforcing villeinage are comfortable to the law of Christ; and it would seem that they are not: for it is written in the Bible, "The son shall not bear the injustice of the father." Already a third and more of England is in the hands of the Pope. There cannot be two temporal sovereigns in one country; either Edward is King or Urban is king. We make our choice. We accept Edward of England and refute Urban of Rome. Christ delivered his gospel to the clergy and doctors of the church, that they might administer it to the laity and to weaker persons, according to the states of the times and the wants of men. 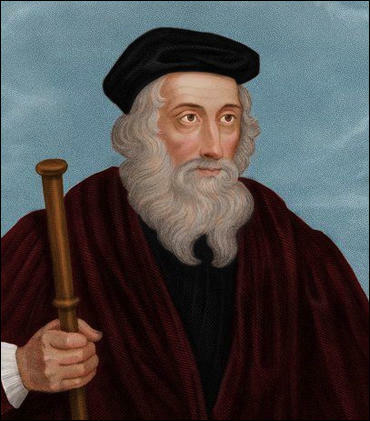 But this Master John Wycliffe translated it out of Latin into English, and thus laid it out more open to the laity, and to women, who could read, than it had formerly been to the most learned of the clergy, even to those of them who had the best understanding. In this way the gospel-pearl is cast abroad, and trodden under foot of swine, and that which was before precious both to clergy and laity, is rendered, as it were, the common jest of both. The jewel of the church is turned into the sport of the people, and what had hitherto been the choice gift of the clergy and of divines, is made for ever common to the laity. 1. That when the Church of England began to mismanage her temporalities in conformity with the precedents of Rome, and the revenues of churches were appropriated to several places, Faith, Hope, and Charity began to take their leave of her communion. 2. That the English priesthood derived from Rome, and pretending to a power superior to angels, is not that priesthood which Christ settled upon his apostles. 3. That the enjoining of celibacy upon the clergy was the occasion of scandalous irregularities. 4. That the pretended miracle of transubstantiation runs the greatest part of Christendom upon idolatry. 5. That exorcism and benedictions pronounced over wine, bread, water, oil, wax, and incense, over the stones for the altar and the church walls, over the holy vestments, the mitre, the cross, and the pilgrim's staff, have more of necromancy than religion in them. 6. That the joining of the offices of prince and bishop, prelate and secular judge, in the same person, is a plain mismanagement, and puts the kingdom out of its right way. 7. That prayer for the dead is a wrong ground for charity and religious endowments. 8. That pilgrimages, prayers, and offerings made to images and crosses have nothing of charity in them and are near akin to idolatry. 9. That auricular confession makes the priests proud, lets them into the secrets of the penitent, gives opportunity to intrigues and other mortal offences. 10. That the taking away of any man's life, either in war or in courts of justice, and upon any account whatsoever, is expressly contrary to the New Testament which is a dispensation of grace and mercy. 11. That the vow of single life is the occasion of horrible disorders, and betrays the nuns to infamous practices. 12. That unnecessary trades are the occasion of pride and luxury. Wycliffe, seeing Christ's gospel defiled by the errors and inventions of these bishops and monks, decided to do whatever he could to remedy the situation and teach people the truth. He took great pains to publicly declare that his only intention was to relieve the church of its idolatry, especially that concerning the sacrament of communion. This, of course, aroused the anger of the country's monks and friars, whose orders had grown wealthy through the sale of their ceremonies and from being paid for doing their duties. Soon their priests and bishops took up the outcry, followed by the archbishop, Simon Sudbury, who took away Wycliffe's salary at Oxford and ordered him to stop preaching against the church. When even that failed, he appealed to the pope. Nevertheless, Wycliffe continued speaking his mind to the people in his sermons. King Edward was sympathetic to his preaching, and he also had the support of others of high rank including John of Gaunt, the Duke of Lancaster, the king's son, and Lord Henry Percy. The following points, taken from Wycliffe's sermons, summarize his teachings. * The holy eucharist, after consecration, is not the actual body of Christ. * The church of Rome is no more important than any other church, and Peter had no more power given to him by Christ than any other apostle. * The pope has no more power than any other priest. The gospel is enough for any man, without the rules of men, which add nothing to the gospel. Neither the pope nor any other church official has the power or right to punish transgressors. In 1377, Wycliffe was ordered to appear before his bishops and answer to their charges, since he had continued to preach on these matters after having been told to stop. He appeared before them on Thursday, February 19, 1377, accompanied by four learned friars. The Duke of Lancaster and Lord Percy became involved'in a heated argument with the bishop over whether Wycliffe should be allowed to sit or must remain standing., Soon arguments gave way to threats, the whole assembly joined in taking sides, and the council had to be dissolved before it was even 9:00 a.m. Wycliffe had escaped punishment for his beliefs. Soon King Edward III died and his grandson, Richard II, took the throne. The Duke of Lancaster and Lord Percy gave up their government positions and retired to private life, but Wycliffe still enjoyed the support of many noblemen. In 1377, Pope Gregory sent a message to the University of Oxford, rebuking it for allowing Wycliffe's doctrine to take root and demanding he be silenced. This encouraged the archbishop of Canterbury and other bishops, who decided to meet and agree on what should be done to punish Wycliffe. (7) John Foxe, Book of Martyrs (1563) page 48 of 2014 edition. (24) John Foxe, Book of Martyrs (1563) page 48 of 2014 edition.